One of the best kinds of popcorn is chocolate popcorn but it can be hard to find. Luckily it is easy to make your own if you follow any of our chocolate popcorn recipes. We've scoured the Internet and popcorn books and relied on our own experience to gather the best chocolate popcorn recipes we've found. A nice thing about making your own is how easy it is to add different flavors to a chocolate popcorn recipe such as orange peel, chipotle pepper, or even peppermint. You can also use the quality of chocolate you like, as well as the darkness you prefer. 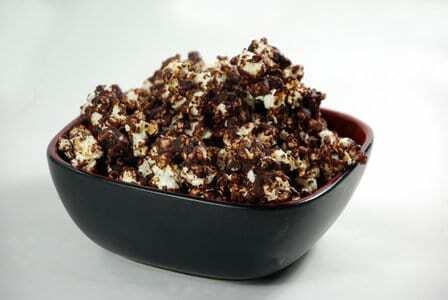 Now enjoy the best chocolate popcorn recipes we have to offer! Two of my favorite things are chocolate and peanut butter. They're great in peanut butter cups, cookies, cake, and candy bars. I figured why not try them together with popcorn. This easy-to-make peanut butter and chocolate popcorn recipe is great to prepare at home. I love dark chocolate and I love popcorn so I wanted to try and find a way I could blend the two tastes. I came up with the simple dark chocolate popcorn recipe and it's super easy to make at home. Many chocolate popcorn recipes call for milk or dark chocolate. However, my wife loves white and this chocolate popcorn recipe introduces the subtle flavors of white chocolate with the popcorn. Chocolate and popcorn is such a great pairing and there are hundreds of different chocolate popcorn recipes! Here we give you a chocolate covered popcorn recipe that takes freshly popped popcorn and coats it with sweet milk chocolate.